Guests and Members can post here. NOAA fudged the data which was used for the 2015 UN summit, expose here. Only the first 30 mins is worth watching. After that, it goes into conspiracy NutterLand, cuz LaRouche. Dems do the same, present sane proof against DT but for insane reasons (they are party above country, too). No science analysis is complete without reference to the long-past, which was an important component of the Global Warming Swindle video earlier on this page (I now have the full 2-hour version, bought it). So here's a Youtube video by another scientific guy, Bob Carter, on paleoclimate and its role, vs what's claimed as manmade climate change now. WILL SURPRISE YOU. This by UK weather guy Piers Corbyn brother of Jeremy who's LABOUR party, so is not siding with the left on #climatechange, provides a lot of useful data you can ponder. LEARN THIS YOURSELF. Don't believe the spokespeople just cuz they have degrees. It's NOT hard to figure out, once you know basics like sun, moon, tides, clouds, atmosphere. Al Gore LIES and it's obvious he does. RUSSIA ties w him go back to his dad, and of course Russia would like it very much if we all wasted our money on a hoax. Have updated the Moment and added a ton of #climatechange refs, just search on my @brainouty name and #climatechange IN Twitter. You don't have to sign in to view the material. It doesn't include ALL the videos here. I will keep adding more, from time to time. There's so much to post on this, I've started curating the posts in twitter using #climatechange hashtag. You don't need to be signed into twitter, to do that. First, notice that YES they are expecting us to enter a COOLING already. Notice that because the Earth is NOW warmer than 'on trend', they INSIST it's man-caused. Never mind, that 'trend' is always a smoothing out, that they do not have valid actual data for all prior warmings to know if the variance is 'normal', and are instead ASSUMING rates. So instead, maybe late-to-start in a cycle pre change (just like a menstrual cycle), but then once it starts, it is made up. CUZ THEY KNOW THE EARTH ECCENTRICALLY TURNS. So yeah, it really is a hoax. It doesn't conform to all their manufactured past ASSumptions, so oh my EVEN THO THEY KNOW WE ARE ENTERING A COOLING PHASE, THEY STILL INSIST ON COOLING MORE, despite even their own data proving the earth COMPENSATES for past 'eccentricities' in the next cycle. So now we'll waste money we really need to develop mechanisms to KEEP WARM for our next little Ice Age coming up within a 100 years or so. And millions might die from plague. POLITICS have no place in weather analysis. This, is why. Suggestion on how Bannon could do a movie ('doc') on how it's not global warming aka climate change that threatens, but global COOLING: https://www.brainout.net/downloads/wma/CoolingMovie.MP3 . SO WE DO NEED A WALL along the US/Mex border, to SOAK UP THAT SUN TO STORE UP FOR THE UPCOMING DANGEROUS COOLING. [b]Suggestion on how Bannon could do a movie[/b] ('doc') on how it's not global warming aka [i]climate change[/i] that threatens, but [b]global COOLING[/b]: [url]https://www.brainout.net/downloads/wma/CoolingMovie.MP3[/url] . In short, if you just READ THE DATA, you can figure out a lot. You don't have to be a physicist. Duh: for centuries, people knew sun and clouds and rays caused climate, and planned accordingly. We just have more precise explanations, now. Versus, the ever-lying climate change proponents, who were in the 1960s, 'get back to nature' hippies (me among them). I'd have never known any of this, if Anonynomenon hadn't found that Matt24 meter, cuz that forced me to study whether the parsing matched what we now call history, which was back then, prophecy. I noticed the peculiar similarity between the causes of the bubonic plague in Justinian's day and the Black Death: BOTH WERE IN COOLING PERIODS. And oh, the 'scientists' hawking 'climate change' KNOW we're ENTERING another COOLING period. So why be suicidal and drop the temperature now? Have worse plague? See how they abuse the graphs in the just-prior video and that by Dr. Ivar Giaever's. Every time I think the human race cannot sink lower.. it does. Just to chime in here, I find a lot of data collection on temperatures (even in my own location) are often DOCUMENTED very poorly as there are multiple sources. Some sources I've seen make the place where I live as being super hot... when that's not the case at all and there is other data to (rightly) contradict that. Another issue is when people hallucinate about weather and temperature that's status quo. Because they in their subconscious "it's getting hotter" they react poorly to warm temperature that we have always been getting AND IGNORE the very cold portions of temperature. Which is actually detrimental if they're hypnotized thinking it's not getting cold or does get cold--as disregarding extreme cold temperatures is dangerous. It's no joke or fantasy, extreme cold and massive snowfall can kill you. Most people wouldn't have been able to survive in some of the extreme cold weather I've walked for a few miles in. That's my issue with Donald Trump. IF he does anything which IS correct (and controversial), he makes the truth look like a lie--and that gives less credibility to those who have valid reasons. Just to chime in here, I find a lot of data collection on temperatures (even in my own location) are often DOCUMENTED very poorly as there are multiple sources. [u]Some sources I've seen make the place where I live as being super hot[/u]... when that's not the case at all and there is other data to (rightly) contradict that. Another issue is when people hallucinate about weather and temperature [i]that's status quo[/i]. Because they in their subconscious "it's getting hotter" they react poorly to warm temperature that we have always been getting AND IGNORE the very cold portions of temperature. Which is actually detrimental if they're hypnotized thinking it's not getting cold or does get cold--[b]as disregarding extreme cold temperatures is dangerous[/b]. It's no joke or fantasy, extreme cold and massive snowfall can kill you. Another related video, some kind of panel discussion. Interview with the indominitable Freeman Dyson, who calls the hype, 'crazy' even tho he also says that of course man has an effect on climate, but extra Co2 is GOOD. Interview with the indominitable Freeman Dyson, who calls the hype, 'crazy' even tho he also says that of course man has an effect on climate, but extra Co[sup]2[/sup] is GOOD. There's a goodly collection of other videos alongside that one, if you watch the vid in Youtube. It's just a bunch of LEMMINGS who hear 'environment' and don't even bother to READ what's hyped, driving this LIE of 'climate change' by the stinking, lying, power-mad UN. Pray for their downfall. Better still that they wake up, but I seriously doubt anyone wants to wake up from such strong delusion. This is the ONE THING worse than DT. Never thought I'd say that. So why didn't CONGRESS have to ratify the agreement? So then vile DT can just unsign it, without Congressional consent, too. I hate the guy, but withdrawal was a good decision. Initially I didn't think it was, but now after reading the Agreement, it's a godsend to withdraw, and fortunately vile Obama did it wrongly, so now we can get out. UN will try to claim we still owe our 'nationally determined contribution', but since Congress has to approve the funds, they won't be, and vile UN can do nothing about it. It goes downhill from there. The ripping of national sovereignty, the forcing of developed nations to pay for the less-developed, and the throttling on the less-developed all under UN aegis, is clearly intended, as you'll see if you just READ the thing. I can just see the headlines in a year or two, with Germany and France arguing over their 'share' in the EU limits, and so many people leaving the EU so they can set their own 'nationally determined contributions' which honey.. can be ZERO. This Agreement has no teeth, and less meaning, so even the drafters and signatories know it's a hoax to play to their local constituencies. You know, 'we have this historic Agreement' which does NOTHING. And when the 2C goal of reduction (which might actually harm the human race) is not achieved (since it cannot be), then everyone can blame the other guy for it failing. I detest vile Donald Trump more than anything, but it is true that climate change is a hoax. You need look no farther than the official Paris Agreement itself to know it's instead a political gambit for developing countries to get money from the developed countries, all under the stinking United Notions. But hey: just read the official Paris Agreement, via the UN-sponsored official download site, see for yourself. Pick one of the 'Authentic' pdfs on the right frame on the page, in your fav language. 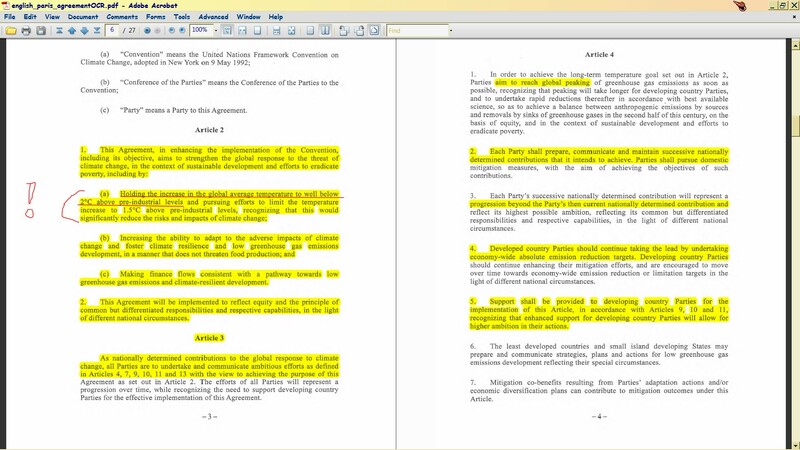 It is technically an attachment to the 1992 Framework Convention which defines terms in the Paris Agreement (see the latter's Article 1). So here;s the link to the 1992 Framework Convention, https://unfccc.int/resource/docs/convkp/conveng.pdf. The Convention is an update on a 1972 agreement, but so far I don't see much ref to it in the 1992 Convention's language. Paris and 1992 Convention are VERY different. The latter is vague, the former is just short of a mandate binding on parties, with a clause in Article 16 that allows the Members to CREATE a virtual dictatorship if they want. With the UN itself at the head, of course (Article 17). So what started as a kind of mutual recognition (based o false science, but still harmless) is now turning into a way to destroy a nation's sovereignty via the successive increasing control of other nations. Firefox Text2Voice addon is what I used. Microsoft Anna, if set at 4 4 pitch and speed, does a decent job of reading in FoxitReader. I used to be very pro-UN, until I got a scholarship to study there in the mid1970s. So my anger is not like the typical right-wing nonsense you'll hear. It's based on BEING THERE for a semester. There's no genuineness there. They only party and posture and try to get money from nations richer than themselves. But it is a step above going to military war every year, as nations used to do. PS so-called 'greenhouse gases' in the very unscientific Accord, are not the cause of global warming or cooling. Rather, the SUN ACTIVITY (i.e., solar flares) and the CORE of the Earth (i.e., magma warming and sending out shoots) plus WIND and OCEAN currents (which are in part determined by the foregoing three) are what cause weather. NONE OF WHICH MAN CAN CONTROL OR INFLUENCE. That is real science. Not, the claptrap of the #ParisAccord. Which, if they did succeed in reducing the temperature by 2 degrees centigrade, would be the BIGGEST DROP IN TEMPERATURE SINCE WE HAVE HAD DATA TO MEASURE, and could well cause catastrophe: for the 2 degrees is an AVERAGE, which means much lower in certain parts of the world than others, so many could die (not the least because a lower temperature is better for fleas carrying disease). But hey: just [b]read the official Paris Agreement[/b], via the UN-sponsored official download site, see for yourself. Pick one of the 'Authentic' pdfs on the right frame on the page, in your fav language. It is technically an attachment to the [b]1992 Framework Convention[/b] which defines terms in the Paris Agreement (see the latter's Article 1). So here;s the link to the 1992 Framework Convention, [url]https://unfccc.int/resource/docs/convkp/conveng.pdf[/url]. The Convention is an update on a 1972 agreement, but so far I don't see much ref to it in the 1992 Convention's language.